Directing brothers Doron Paz and Yoav Paz won a lot of acclaim for their Israeli horror Jeruzalem (review) which won over many a horror fan when it premiered in 2015 and now the pair are back with yet another horror movie though this one is distinctly different. The Golem takes on the famous Jewish narrative of the golem and turns back the clock to an outbreak of the plague. The movie centers on a young woman named Hanna (Hani Furstenberg), a mystic who uses her powers to summon an entity which she believes will save her tight knit community from both illness and the foreign invaders at their doorstep. I'm always on board for a good period horror and the trailer for The Golum suggests that this may deliver. Israeli actress Hani Furstenberg held her own remarkably well in The Loneliest Planet and she seems up to the task here plus the period trappings look up to snuff. 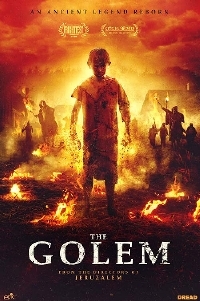 The Golem will be available on VOD February 5.